The above info came from Blair Tindall, and was edited by yours truly (contact me). The image came from The Oracle. Mega Octane Dolralier W.A.R.S. W.A.R.S. When Koji Odishi's father is abducted by the Decepticons, he meets Optimus Prime, the Autobots, and their AI construct, TAI. 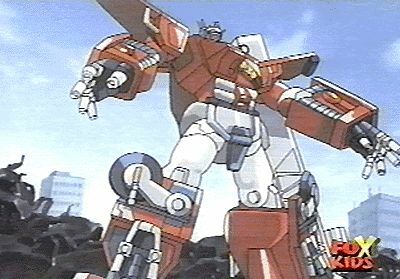 With the Autobot's help, Koji must rescue his father from Megatron's grasp. After Koji's father is rescued, the Autobots begin the search for the O-Parts, devices that when brought together grant unimaginable power to the collectors. The race is on! Note: The U.S. airing of Robots in Disguise was affected by the September 11th attacks. Some episodes were skipped while other scenes in certain episodes were edited. The above description came from Blair Tindall, and was edited by yours truly (contact me). 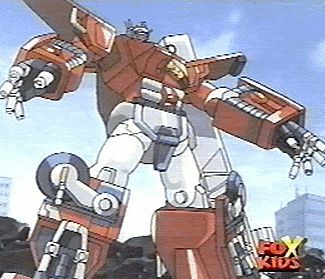 In the year 2001 the Autobots, led by Optimus Prime, have integrated themselves completely into human society, sometimes even acting as vehicles for humans. As part of this integration, they have modified everything from buildings to roadways to serve their purpose: protect Earth from invasion. All seems peaceful until one day, the Predacons arrive. Led by the powerful Megatron, it is rumored that these Cyber-Beast Transformers are super-soldiers from another time and dimension. When Koji Odishi's father is abducted by the Predacons, The Autobots are called into action and must face these new enemy with all their abilities and teamwork in a battle unknown to the general public. The above description came from fractyl2, and was edited by yours truly (contact me).